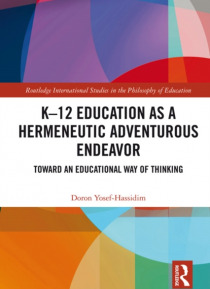 Considering the role of compulsory mass education and schooling in a democratic society, this book introduces an alternative vision for K-12 education as an "e;adventurous endeavour. "e; Grounded in a strong theoretical framework, Yosef-Hassidim reveals the negative impact of instrumentalization of schools: when education is considered a social and political instrument, it serves dominant s… ocial forces' interests rather than students' or humanity as a whole. Offering conceptual and pragmatic frameworks to limit political influence on schooling, the author proposes a new hermeneutical structure that restores education's agency and separates it from external social forces, and provides the foundation for regarding K-12 education as a sovereign social sphere in its own right.